Jill Sheffield is the founder of Women Deliver, an international advocacy organization that convenes global leaders to galvanize action on maternal health and women’s empowerment. Most recently, Ms. Sheffield was one of few civil society representatives appointed to the UN Secretary General’s Commission on Information and Accountability for Women’s and Children’s Health. Ms. Sheffield is the Chair of the FIGO Working Group on Contraception, serves as a Senior External Adviser to the IPPF Governing Council, and is on the Board of PPFA/Global. She is also a consultant/senior adviser to Global Health Strategies on reproductive health and choices. Ms. Sheffield is also the founder of Family Care International (FCI), a distinguished non-governmental organization and winner of the 2008 United Nations Population Award for outstanding work in sexual and reproductive health and rights. Ms. Sheffield completed advanced degrees at Columbia University, Teachers College, where she was later recognized as a distinguished alumna for her international work in women’s health and education, and she also received the American Public Health Association’s Lifetime Achievement Award in 2008. She was Director of International Programmes at the Carnegie Corporation, and founded FCI in 1987 in response to the call at the Women’s Decade Conference in Nairobi which identified the silent tragedy that one woman dies each minute from pregnancy related causes. 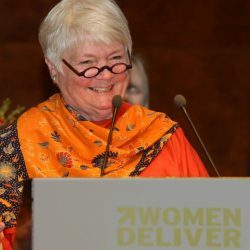 Though she has played a central role in several key world conferences, Jill Sheffield believes her true education came in the late 1960s when she worked in Nairobi, Kenya’s Pumwani Hospital in the first family planning/reproductive health outpatient clinic opened in East Africa.